One or more photo(s) has been virtually staged. BRAND NEW TILE ROOF being installed - VALUE $50K!! Lovely spacious home located in the gated community of Bayside. Situated on a CUL-DE-SAC without any houses on either side, this home seems like its on the block all by itself! 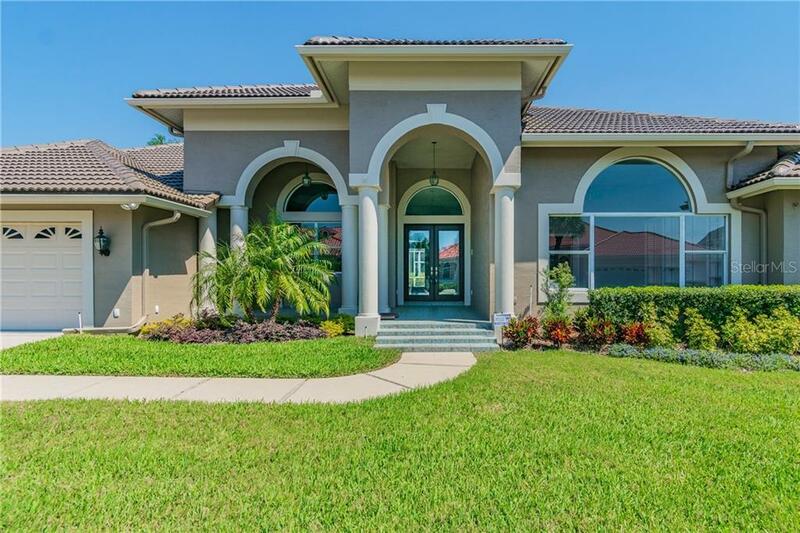 This home is just OVER 3800 SQUARE FEET, bright & light with windows galore & you will love the HIGH CEILINGS & open floor plan! FRESHLY PAINTED EXTERIOR AND INTERIOR, BRAND NEW CARPET, tile professionally cleaned and re-grouted, giving the home a new and fresh look. All of the rooms are ample sized, so plenty of room for everyone to roam! There is a great BONUS ROOM with built in shelving on both sides, that could be used for an office, craft room, etc! The eat in kitchen is enormous with 42" cabinets, island, and breakfast nook. The family room is just off the kitchen & has a fireplace & built in shelving, with crown molding. You will love the large laundry room with all its storage & cabinet/counter space. SPLIT FLOOR PLAN with all 3 guest bedrooms on one side are 14x14, & can be shut off with a pocket door separating them from the rest of the house. The master bedroom is large & has 2 walk in closets & sliders out to the pool. The master bath has a garden tub & walk in shower. The pool area is complete with a SUMMER KITCHEN & FULL POOL BATH OUTSIDE, so no tracking through the house with wet feet! This home has great bones & just needs a little of your own personal touch! Only 15 mins to the airport, & 5 minutes to Berkeley Prep School, with easy access to both sides of the bay!